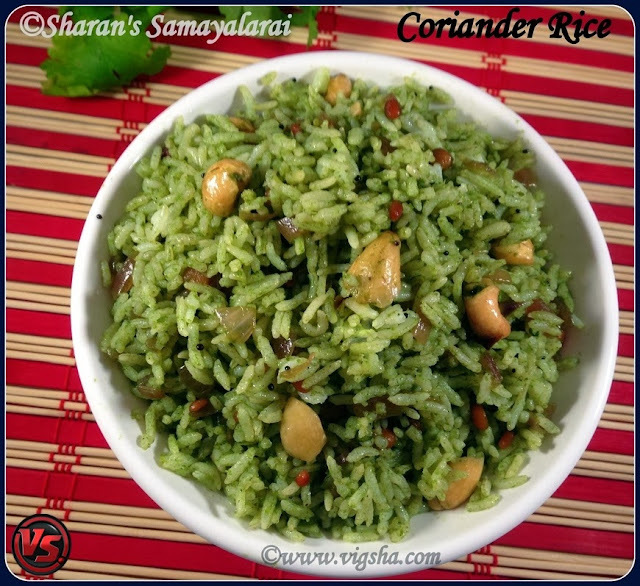 Coriander Rice is a very simple and flavorful lunch-box recipe. Try this simple recipe & flare up your taste buds.. Cilantro has good source of dietary fiber & high nutritional value. 1). Pressure cook rice with sufficient water until the grains are separate (firm). 2). Wash coriander leaves and finely grind it along with ginger and green chillies with very less water. Keep this paste aside. 3). Heat oil in a pan, add mustard and let it splutter. Add urad dal and channa dal, roast till golden brown. Then add chopped onions and hing, saute until the onions turns translucent. Then add the cashews and saute. 4). Add the grounded paste, needed salt and saute till the raw smell goes and oil separates. Add rice and combine well. Enjoy this tasty and satisfying rice with Raita ! # Cashews are optional, it just adds a crunchy feel to the rice. You can also substitute it with peanuts. # Use ghee when packing this for kids lunchbox. It adds more flavor.